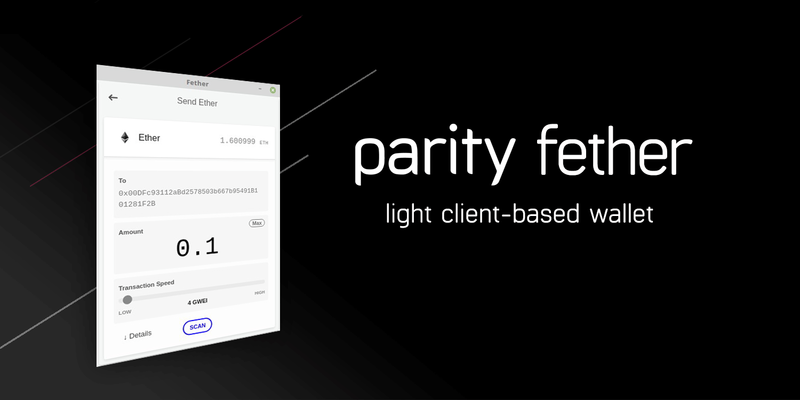 We are thrilled to announce the release of Parity Fether v0.3-beta. This is the first release available on Ethereum Mainnet. Parity Fether is a desktop wallet available on Windows, Mac, and Linux. Unlike any other wallet, it connects to the blockchain in a decentralized manner using a light client, with no third party server relaying the information the wallet displays or sends. As a result, your transactions cannot be censored and there is no risk of server downtime. Fether is now a taskbar application: it can be accessed from the tray icon and it is meant to run in the background. It will quietly and swiftly sync the blockchain to be ready anytime you need it. Although the user interface has received many small improvements to remain clear and easy to navigate, most changes in this version can be found under the hood. Find on GitHub the list of changes. All of this without relying on any third party server or service other than the Ethereum nodes you will connect to! Any feedback and help is welcome. Do you think a feature is missing? Did you have trouble understanding a menu item? Let us know on GitHub, Gitter, Riot, or Twitter. You can help even if you are not a developer, we plan to translate the interface in many languages soon and if you speak another language, we would love your contribution! If you are a front-end developer or aspire to be one, have a look at our repo — we have plenty of good issues to start with. Parity Fether v0.3 is in beta and hasn’t been audited yet. We advise not to use Parity Fether with accounts containing significant amounts of funds.